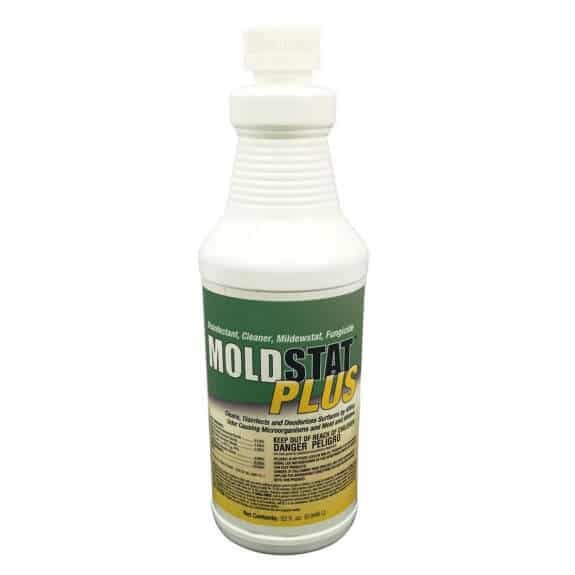 MoldSTAT Plus concentrate, kills mold and fungi. EPA Registered and proven! 4000 sq ft Coverage | Makes 42 gallons. Forget about bleach and the damage it causes to surfaces and colors. MoldSTAT Plus contains no bleach, and won’t harm colors. Soak surface to be treated with MoldSTAT plus mold killing spray, wait 10 minutes, then optionally wipe away the dead mold debris. Ships FREE to any postal address in the US., Need it fast? $4 more upgrades to Priority Mail 2-3 day delivery! After the storms, we had no power for a week, and the natural leaks in our basement meant that the water crept in, and no sump-pump to push it back out. I knew mold was going to be a problem, so I ordered the concentrated moldstat plus (on my iphone). The mold killer arrived before the power came back on, and I was able to mix the solution in some of the standing water. Amazing… it worked! You’ve found the right product. EPA Registration provides the Laboratory proof of a positive mold kill. Mold STAT plus is used by mold remediation professionals to kill mold cold. Especially useful on structural members ( 2×4, 2×6 2×10 etc ) that are not practical to remove. Just mix 3/4 oz to 1 gallon of water and apply…Kills Mold with a 10 Minute soak. It works. Rehabing an old house that still had occasional black mold! Tried cleaning with bleach and other mold cleaners, but they never seem to work or last. A few sprays of this MoldSTAT killed the mold! Even worked on worst places in joists in the basement ceiling. The smell isn’t bad like bleach, but still ventilate the area well – open windows use fans.